Lolabuland » My Xtreme students! Super proud of Werner and Esmeralda for winning Magna Racino on this super challenging course (2nd run in the video), showing all their Xtreme skills!!! Werner and Esmeralda started with my classes even before the era of on-line classes, driving to in-live Puppy Class at my place from Austria. 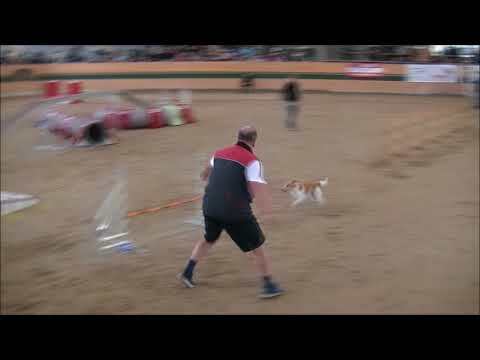 This video features both Esmeralda and Xi, his younger dog - and I love it so much not just because it shows their xtreme skills, but also because it features the xtreme fun they're having out there in the ring! - Werner definitely never forgets on that most important part of it all!!! And just a reminder this is the last week you can still join January Xtreme class! And that tomorrow, Running Contacts class is starting!!! Omg, how amazing runs! I love them and that attitude! Reallly really great fun to watch!!!!! Love following them!!! Such cool dogs and great handling!!!! Wow, so great!!!! Really fun to watch them!!! Such great dogs and great handling!!! Wow! Congrats ! So inspiring !